Learn to make 100 savory and sweet snacks perfect for fat fasts and boosting your fat intake. These delicious, high fat snacks are ideal for Low Calorie High Fat, Ketogenic, and Paleo diets, and are also a great alternative to sugary treats. Use Sweet and Savory Fat Bombs to help shed those stubborn pounds, to fill you up in between meals, or to give you an energy boost before your workout. 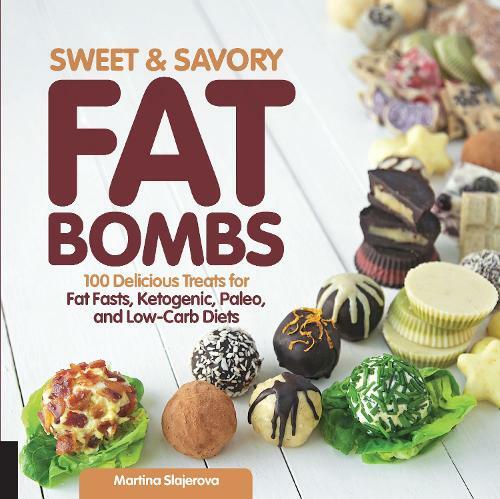 Fat bombs are ideal for boosting your fat intake, as at least 85% of the calories come from fats. These simple recipes include easy to find ingredients, so you'll always have something delicious and high in fat to snack on!